Liberty University officials announced that potential presidential candidate and former Florida Gov. 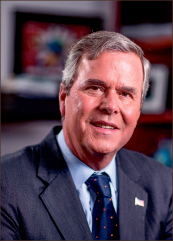 Jeb Bush will speak at the school’s 42nd Commencement Saturday, May 9. During his time as governor, Jeb Bush was well known for his education reform. Recently, he is known for his support of Common Core. Jeb Bush also campaigns for comprehensive immigration reform, and he is a strong gun rights advocate. The former Florida governor announced Dec. 16, 2014, he would “actively explore” a run for president, though there is no specific timeline for an official announcement. Jeb Bush formed a leadership political action committee Jan. 6, 2015. Jeb Bush is the younger brother of former president George W. Bush and is the son of former president George H.W. Bush, who addressed Liberty graduates in 1990. Jeb Bush graduated from the University of Texas at Austin with a degree in Latin American affairs and served as Florida’s Secretary of Commerce before being elected governor. Commencement will take place in Williams Stadium at 10 a.m. Saturday, May 9.